What can i say except what a fab holiday we all had at this hotel. The rooms were spotless. always something we all enjoyed to eat. The animation team were great with kids especially luibo who my son adored and wanted to stay with him!! We stayed on an all inclusive basis and we found the food very good but a bit predictable. We couldn't fault the hotel which was extremely clean and our room was really spacious. We stayed at the beginning of the season so more than enough sun loungers. The indoor swimming pool was a nice idea but it was freezing cold and shut at 6pm. The location of the hotel was perfect, near to the shops and just across a bridge to a beautiful sandy beach. The restaurant staff were really helpful and cleared the tables quickly but we did find some of the bar staff quite miserable. The entertainment team worked extremely hard and were a very happy bunch and loved playing with the children. A few professional acts would have been appreciated as we found the evening entertainment very boring. All in all our holiday was enjoyed by all. We stayed for one week and didnt want to go home. The food was quite good and while we was there they had a Bulgarian food theme night which was delicious. The location was fine and there where alot of shops selling fake designer clothes. People around Bulgaria are really kind everybody seemed to be treated the same. The sea is lovely and very clear. The hotel was good and was cleaned daily. While we was in bulgaria we went to TJ's Pub several times and the woman who seemend to be the only waitress there remembered our order each day. The entertainment in the hotel was Ok but the thing that made it special was that the enteratainers tried there hardest . This hotel is huge, however it is divided into 2, and so all your requirements are located in your part of the hotel. Staffs were very helpful and polite. Was given a free courtesy room for an hour at the end of our stay to freshen up, as we were not being picked up until 7.30pm. The pools are clean but cold. It didn't stop our daughter playing in there at every opportunity. Restaurant is large, clean and there is plenty of variety, if you're a big meat eater. We did struggle a bit due to some of us were vegetarian. Entertainment was ok, they all tried extremely hard and the kids loved them. Location is great, far enough away to not be disturbed at night, but close enough to go out in the evenings. Beach was just across the bridge. Downside to this hotel is the sunbeds, if you want a sunbed in the sun for the whole day you had to be prepared to put towels down by no later than 7am. 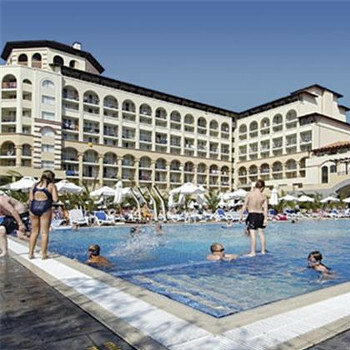 I would recommend this hotel to all it is certainly one of the best hotels I could see in Sunny Beach. what a fantastic holiday the towels were changed every day and the rooms were spotlessly clean, the food was lovely there was something for everyone, the only prob is the same old sun lounger trouble but thats the people not the hotel i would most definately go back it was set in beautiful grounds and located in just the right area sligghtly out of the real hustle bustle but in walking distance if thats what you wanted. We stayed at this hotel half board for 2 weeks and found the hotel staff very friendly and helpful. The food was alright but sometimes we found it hard to tell what the meat was as they used a lot of sauces. There is a lot of salads and fresh fruit and tinned fruit available as for breakfasts the omlettes are to die for and we all tried them they cook them while you wait. It was my 50th birthday when I was there and the staff provided a cake for me also my daughter arranged for ballons and banners to be put up and a large cake to be provided at the evening meal and the food manager brought the cake and the waiting staff sang happy birthday it was a lovely treat. The entertainment team are absoulty brilliant and tried to please everybody with shooting darts and cocktail games only for adults as well as 2 childrens teams during the day. They then put on a show everynight for family entertainment and tried to get most people envolved.There was waterpolo also everyday. The pools were very clean and we were in swimming everyday with no worries as there was a lifeguard on duty by the pools. Could recommend this hotel to anyone and would be happy to stat here again. First visit to Bulgaria and to an Iberostar hotel. Not disappointed on either front. As we'd read in earlier reports, the hotel experience from start to finish was excellent - from efficient registration(chilled soft drink on arrival), daily maid service, prompt maintenance service(shower needed a repair once), attentive and courteous bar/restaurant staff, enthusiastic animation team, to checking-out in the middle of the night (with coffee provided in lieu of breakfast). Nothing appeared too much hastle. Animation team did a good job - although we'd no kids, we feel that families will get a good deal out of the various kids groups/activities. Public areas were kept spotlessly clean - there was a cleaner on the go at 2.30am when we left! The pool area was kept clean also - beware the temperature difference between the two pools - you've been warned! Buffet food supply was extremely varied, plentiful, hot (when necessary! )and even a fuss-pot like me managed to have something different every night of the entire two weeks - putting on 4 pounds in the process! We'd planned to eat out on a couple of ocassions but quite frankly there was no need. Had no need to buy/sample the food from the outside bar. Situation in the resort could hardly be better - a very short distance from the beach and any amount of night-time activities you could want. Beware the wooden bridge to the beach though - a proverbial death trap to feet. Not much more to say - excellent for what we went on holiday for - good old R & R in very decent surroundings/ambiance indeed. PS - Balkan Holidays were spot-on too - no flight delays, no baggage lost, transfers ok, orientation meeting ok, rep was seen at hotel when he was meant to be there, (2) excursions were trouble free. The pools areas are very busy and crowded. You HAVE to reserve loungers(towels) or you will not get a lounger. In fact the lack of loungers is a problem and I witnessed on two occasions people taking parosols and beds sneakily while their users were elsewhere. This led to rather heated arguments when said users arrived back. Not what you want or need to see while on holiday. Staff are on the most part affable but not as much as they might. One or two individuals are actually rude and unhelpful. One waiter when asked for drinks said abruptly that he was finished and made no attempt to organise someone else to take my order. He just stood there talking with other members of staff. By the way on ordering drinks it semms the waiting staff want you to leave a tip each time. On one occasion we had left our money in the bedroom so we decided to charge the drinks to our rooms. The waiter seemed aggreived when we did not offer tip on receiving our drinks. for the rest of the meal he left the plates from our buffet pile up on the table untill we just staarted to laugh at it and decided to see how far he would let it go so.......at the end of our meal we could hardly see each other with all the plates,bowls, galsses on the table. Not what you would expect froma 4 star establishmnet. (btw we did tip every night other than that night). The entertainmant staff try very hard and we couldnt fault them in their efforts but was rather dull and unengageing. (if you like lip synching to musicals then your in luck). The drinks at the hotel are very costly compared to outside and the menu limited. The location is good just a short stroll to the beach and nightlife. All in all i have to say i would not go back to this hotel or resort as there was nothing to make it stand out. Adequate and no more. we booked to stay at this holiday at the beginning of 2007 for August 2007 and my main needs were for a nice clean child friendly hotel as i was traveling with my 10month old twins, the first choice brochure stated that there was a childrens club and they took children under the age of 1 so i was happy and all looked good online and in the brochure etc. my first impressions were excellent we were warmly greeted by the hotel staff and a porter helped us to our room, there was no tea/coffee facilities in the room to my disappointment so the porter kindly got me some boiled water for the twins so i could make them a bedtime bottle which was very kind of him as we had arrived late and everything was closed. The room was lovely and spacious more then i could of ever expected. But day 1 was where the problems started we left our room to go down to reception to get a safety deposit box for our money the cleaner was cleaning the bathroom so we just left her to it mistake 1 we left the money hidden in our hand luggage bag, we got the safety deposit had breakfast and returned to our cleaned room, went to get the money out of the bag and it was GONE we reported it to reception who took 2 hours to send someone to our room to check the key card machine as apparently they could get a read out of who had entered the room which showed the cleaner and us. the hotel refused to question the cleaner and wouldnt take the matter any further so we reported it to the First choice rep whos attitude was these things happen just get on with your holiday easy for her to say when 600pounds had just been taken from our room. the facilities at the hotel were awful no creche for my twins as stated in the brochure and also no evening babysitting facility which was stated in the brochure and also in the paperwork brochure at the hotel. the evening entertainment was very amature like and not entertaining at all. The hotel is in an ideal location so luckily we wasnt to far a walk to go out and about to find entertainment it was just disappointing as we didnt want to take our twins far of an evening and i was hoping we could just watch the evening entertainment from out balcony. i would stay at this hotel for me its over priced it dosent have the extra touches i would expect for what i paid. theres alot nicer hotels in the area that i would say would be a lot better then this one... shocking because i know iberostar usually are very good hotels. We arrived at the Hotel at 4 a.m the reception is very impressive and they are cleaning at that time of day. They are cleaning all day it appeared it is so clean everywhere in the Hotel. The room was excellent again clean and very large. The food is buffet style which we found very varied and excellent. The staff are a little too keen to clear your empty plates away but are very friendly. The First Choice rep was excellent and was very helpful and knowledgeable. This is a four star hotel which we would say is a four star hotel in everyway. We would go back again without a doubt and hope visitors to this site find this review helpful.